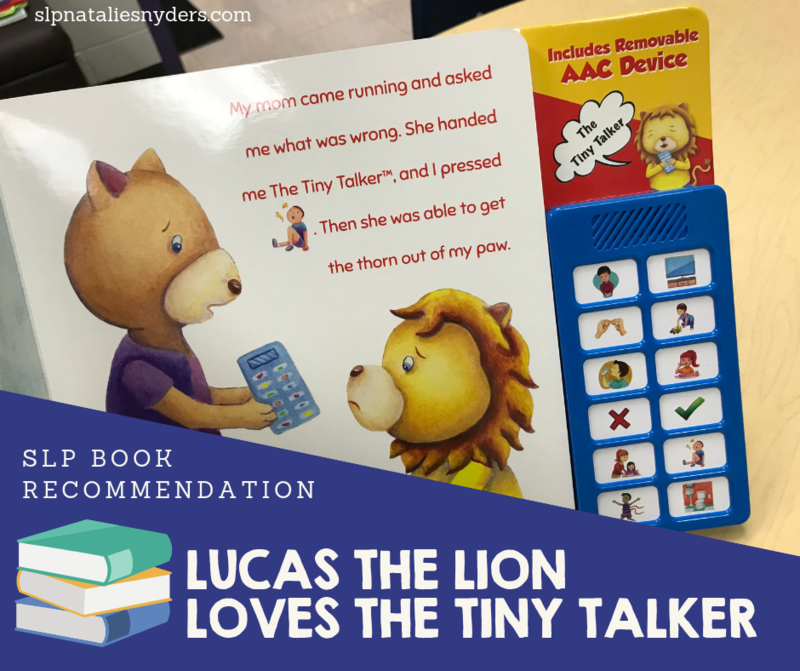 I recently came across a delightful little book on Amazon called, “Lucas the Lion Loves the Tiny Talker.” It was written by two parents for their nonverbal son, and includes a removable basic AAC device. 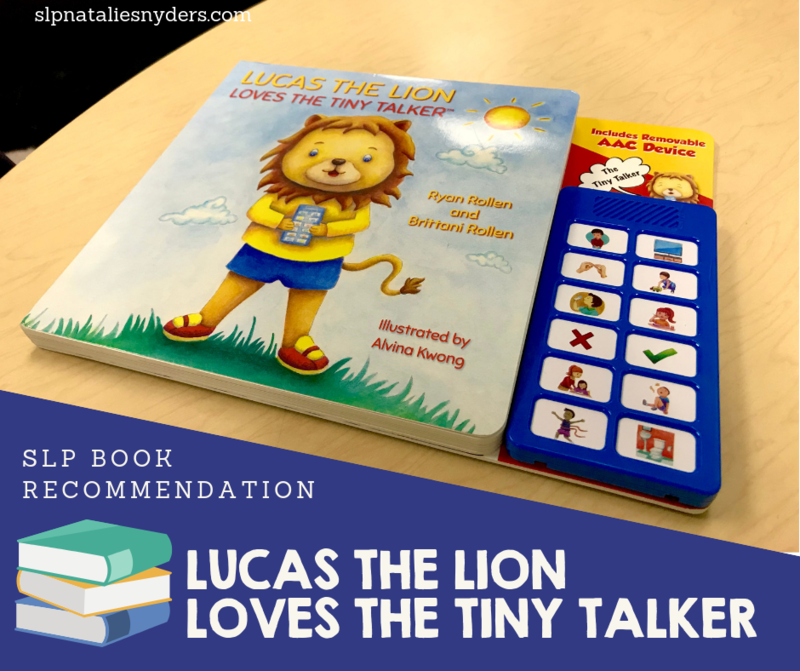 The story itself shows Lucas using the “Tiny Talker” assistive communication device in different situations to help express himself without words. When you read the story, you (or your students) can practice pressing the correct button for each situation. 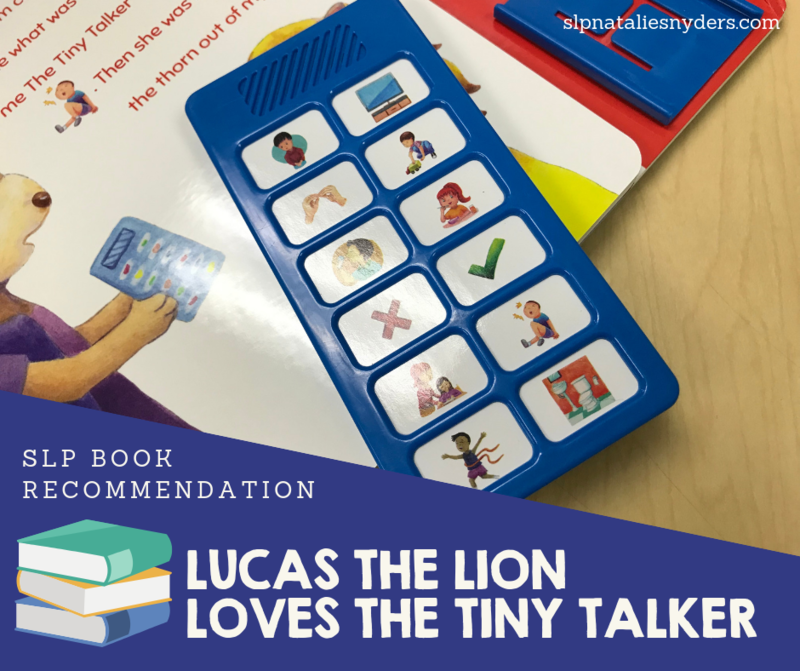 Not only is this interactive book a great introduction for a student you might be thinking about trialing AAC with, I think it would also be great to share with a whole classroom or small groups of students to show how different people communicate. It’s suited best for preschool, kindergarten, and first grade classrooms. 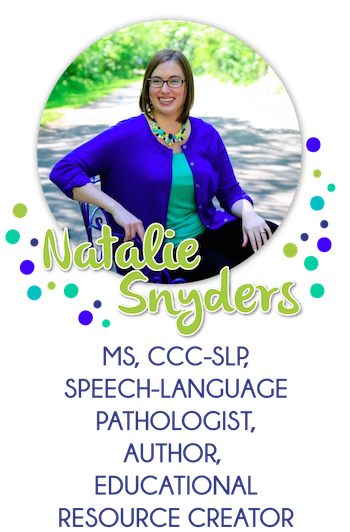 Sharing it with a classroom could be a great way to promote and share more about what we do as speech-language pathologists during Better Hearing and Speech Month in May. The basic AAC device (or Tiny Talker) has 12 buttons with common words or phrases, including “yes,” “no,” “more please,” and “I need to go to the bathroom. While I do really love this book and how it can be used directly in therapy, given to parents as a great model, and shared with entire classes, I do wish the sound clarity was a bit better. Some of the recorded phrases are not as clear as they could be, and they are difficult to understand. I also wish there was at least a mention of speech-language therapy somewhere in the book or description. 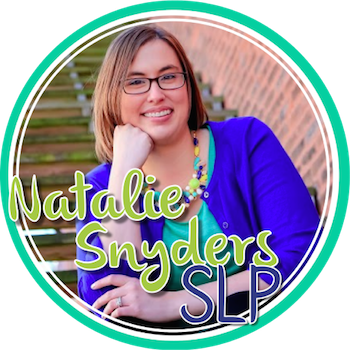 However, at $25, this book is definitely one I recommend for any preschool or elementary school based SLP! 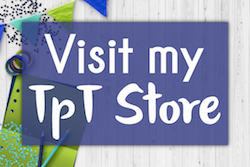 PS: Want more speech-language therapy ideas sent straight to your inbox? Make sure to sign up for my email newsletter! Thank you for sharing this book! This is the first time that I have heard of it and it is now on my MUST GET list! I will be sure to share this information with my parents too! Much thanks!